In this post, I have written about a Mantra Sadhana for invoking a Yakshini called the विभूषिणा - Vibhooshina Yakshini. There is very little information available about the Vibhooshina Yakshini and the methods of invoking her presence or the end results or benefits of invoking or appeasing her. 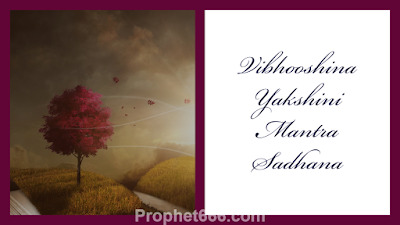 The Mantra given below is said to invoke the Vibhooshina Yakshini if it is chanted 8000 times daily. The Mantra is said to give the desired results, if it is chanted sitting under a Kaner Tree. A Rudraksha Japa Mala can be used to keep a track of the prescribed number of Mantra Chants. There is no information available on specific rituals or in how many days, the practitioner will be able to invoke the Vibhooshina Yakshini or the benefits and fruits of this Yakshini Sadhana. It is also quite possible that all that should be done is to sit under a Kaner Tree and chant this Mantra for the prescribed number of Mantra Chants every day and continue the Sadhana until the Yakshini is invoked. If any of our readers has more information on this Yakshini, he can share his knowledge in the comments section below for the benefit of other readers. Notes- Yakshini and Yaksha Sadhanas are recommended only for experienced practitioners of this specific Tantras. Such Sadhanas, which attempt to invoke the presence of these most powerful being can also be life-threatening and dangerous for the practitioner. There are many known instances where Yakshini Sadhaks have lost their lives or lost their mental balance and become lunatics. Even chanting these most powerful Mantras just for fun or to see what will happen can also be very dangerous. I will be writing about more unknown Yakshas and Yakshinis and the Mantras for invoking them in the near future.